Add custom blocks directly from Layout UI! 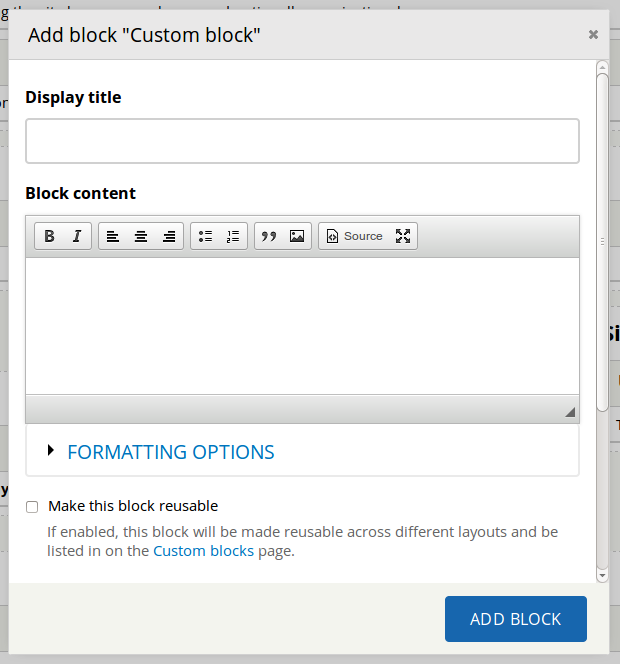 Custom blocks may now be added directly from within the Layouts user interface. Simply click "Add block" in the region you wish to add a block, then select "Add custom block" from the list of possible blocks. Backdrop now supports one-off blocks that exist only within a single layout configuration, or you can use the checkbox option for "Make reusable". Reusable blocks may then be placed again on other layouts. Editing a reusable custom block in one place updates all the locations where that block has been used. And although it's not strictly a UX feature, these reusable custom blocks are now stored in Backdrop's JSON configuration storage system. This means that blocks are now truly "structural" elements to be made by the site builder or developer. Now that they are stored in configuration, these JSON files can be moved between environments to deploy new functionality with ease. Configuration of content types now includes permissions and URL patterns. 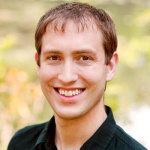 A long-standing issue with the configuration of new content types in Backdrop has been the need to visit several different administrative pages to accomplish a single task. In 1.3.0 we're putting an end to this "pogo sticking" around to configure a single type of content. The content type forms now include settings for both permissions and integration with the automatic URL pattern system introduced in 1.2.0. Taxonomy vocabularies and user account settings have also been updated to allow setting URL patterns directly from their configuration forms. New notification icon is less intrusive and easily accessible. In previous versions of Backdrop, if your site needed a software update or had a critical problem, it would bombard you with huge messages across the top of some administrative pages. This had two downsides: it was very obtrusive on those administrative pages, and it didn't show up at all on other pages like the front-end of your site. To solve both these problems, a notification icon has been added to the admin bar to indicate problems on the status report. Backdrop 1.3.0 contained a number of consistency improvements around user accounts. In addition to logging in by username, Backdrop sites may be configured to allow email addresses in addition to (or instead of) the username. The login form validation also is now more informative, letting you know which value was incorrect (either the username/email or password). The menu items referring to "People" have been changed to "User accounts" for consistency. As with content types, user accounts may now have their URL patterns configured directly from the user account configuration page. And to reduce the clutter of account configuration, all emails for registration, login, password reset, etc. can now be managed on their own configuration page. Responsive primary tabs have behaviors for large, medium, and small screens. The tabs across the top of the page in the Seven theme are now fully responsive and mobile-friendly! This implementation is beautiful and we're excited to have it available on all Backdrop websites. Comment settings are simplified on the content type forms. Long and short text fields may now use each other's’ widgets, allowing a short text to be entered into a textarea or a long text entered into a text field. Multiple field values have a new configuration element that allows a limit greater than 10. The administrative toolbar has been updated with more unique labels, making the admin bar search more effective. The Views administrative page is now responsive and lists views alphabetically. Terminology around "Edit" and "Configure" has been updated to be consistent. Editor selection options are less obtrusive on filtered text areas. Backdrop has steadily been increasing the power of its unique Layout system since its initial launch. In Backdrop 1.3.0, individual fields may be placed in any region on the page. 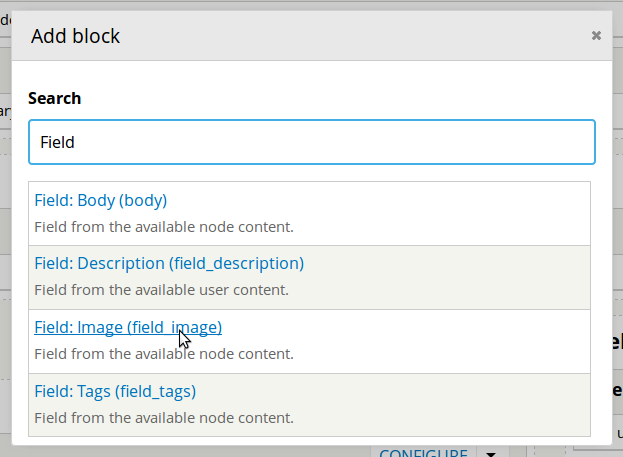 When on paths such as node/% or user/%, each field becomes available to place as a block. Each field on a piece of content or user may be placed individually. These blocks allow you to position field values in any region on the page. These powerful new blocks can be positioned differently on each content type, placed multiple times, and use any of the available formatters for that field. Transliteration from Spanish, Vietnamese, Bulgarian, and Chinese. Note the "Machine name" value to the right of the field. To accommodate for the many situations where only US-ASCII characters are allowed (for example in MySQL table names), Backdrop frequently includes "machine name" elements. Prior to Backdrop 1.3.0, a contributed module had to be installed to automatically convert other characters to their ASCII equivalents. Now Backdrop includes this functionality out-of-the-box in core. Backdrop 1.3.0 includes a powerful new feature for background processing. In previous versions of Backdrop, the end of the page request might potentially run periodic tasks such as updating the search index or clearing expired caches. These tasks are often time-consuming and may delay the delivery of a page. Delays of 5 seconds, 20 seconds, or even longer were not uncommon. 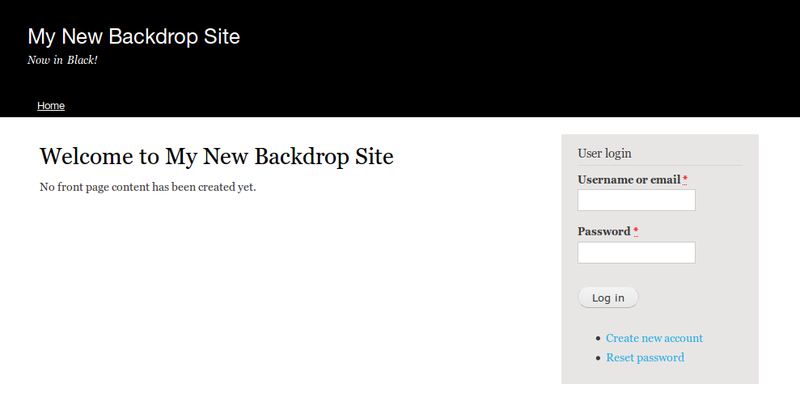 Now Backdrop will deliver the page back to the user as soon as possible and not hold up returning the page on these background processes. This new feature is always on, providing a way for modules to consistently perform tasks without needing to delay delivery of the page. 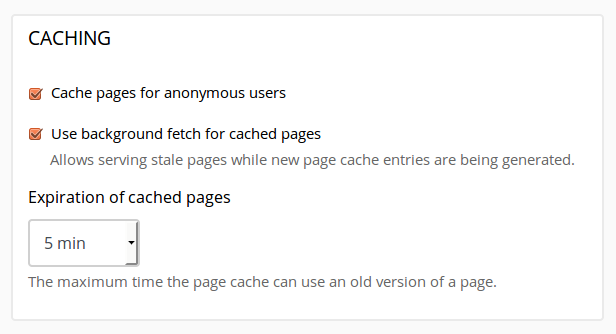 Besides the addition of background processing, the built-in page cache has also been expanded to support "background fetch". This feature is similar to that found in Varnish 4, where after a cached page has expired, it may still be used temporarily while a new copy of that same page is generated. The new background fetch option is on by default, but may be disabled if desired. Rather than having a slow page load once every 5 minutes (or however long a cache lifetime is set), background fetch essentially eliminates slow page loads entirely after a single request. Fresh content is still shown after the cache lifetime, but the generating of this new copy is done entirely in the background. One of the most noticeable things about a new Backdrop 1.3.0 installation is that the familiar blue default theme is replaced with a solid black. This small change separates the branding of Backdrop from its parent project Drupal. Backdrop is now black out of the box. But if black isn't your color, the color settings page for Bartik has also been reworked with new color schemes, such as this "Goldfish" theme. 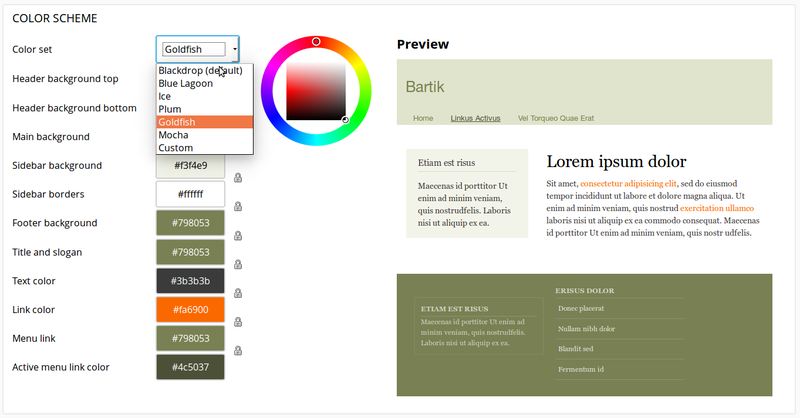 Selecting the "Blue Lagoon" color scheme will revert the Bartik theme back into the legacy stylesheet and is used for sites upgrading from Drupal 7 or previous versions of Backdrop. Thanks to all of our many contributors to this release! It's been a busy past couple of months making this latest release of Backdrop. If you'd like hear more about Backdrop, you can follow Backdrop on Twitter or like our Facebook page. We're also busy working on our next release, and you can join in on GitHub. Backdrop 1.3 is available for download now or you can spin up a new Backdrop site on Pantheon.